They will be Sheffield's best offices - Grade A workspaces with far-reaching views that sit within the £85 million first phase of the city centre's long-awaited redevelopment. And, despite banking giant HSBC signing a deal to move 2,700 of its workers to the new building between John Lewis and the top of The Moor, there is just under 26,000 sq ft of space left over for another occupier. A trio of companies have been looking at 1 Charter Square with a serious view to taking all of the remaining office accommodation, which covers three floors on the side of the block closest to the Wellington Street NCP car park. While property agent Tim Bottrill, who is handling the marketing through his Colloco business, cannot be drawn on the parties involved, he says the site is 'much needed' locally. "If you want north of 12,000 sq ft in a single building, this is your only option," he says. Tim is a founder and board member of the Sheffield Property Association. 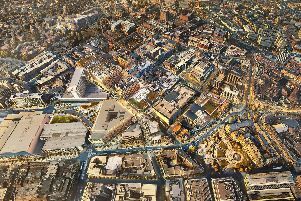 The Star is focusing on the mission of the SPA – which aims to be the ‘collective voice of property in Sheffield’ and was the first organisation of its kind outside London – through a series of features looking at major schemes supported by its members, a diverse group including developers, the universities, planning consultants and solicitors. The Charter Square building – which HSBC staff voted to call Grosvenor House, in a nod to the old Grosvenor hotel which was demolished before construction began – marks the start of Heart of the City II, a £500 million, council-led scheme bringing new shops, hotels, offices, welcoming public spaces and more on 1.5 million sq ft of land. The block is expected to be finished in January, and features commercial units covering 60,000 sq ft on the ground floor. The glass-fronted, terracotta-panelled block faces Debenhams and The Light cinema across a radically revamped Charter Square, brightened up with benches, trees, flowers and jagged stone boulders, soon to be joined by a ‘garden terrace’. Tim says the office market in Sheffield is 'quite finely balanced'. "Another two buildings of this size or bigger and you've got an oversupply and everyone starts to panic - or you've got one building, which is great until it lets. The challenge we face as a city is continuing a very steady and considered supply of stock onto the market. We had St Paul's, then we had Acero, then you've got this. And I think you need that element of competition." For the time being 1 Charter Square, which has a dedicated entrance accessed from Wellington Street, 'sits on its own very well'. "We're quoting £26 a square foot which is moving the headline rent on in Sheffield, which we need to do. Sheffield still offers relatively cost-effective office accommodation when compared to Leeds and Manchester. Office space in London gets more and more expensive, in some places now you're approaching £100 a square foot, if not more." Mark Imms, head of development management at Cushman and Wakefield, oversaw the project for the council, from the initial idea to the delivery stage. "In Sheffield people increasingly look for quality of life," says Mark. "It's about staff retention. It's a city that's got two universities - very educated groups of staff that you can employ." The building, he says, 'kickstarted' HOTCII. "It was fundamental we did the letting with HSBC, that paved the way for a very substantial investment. It was a bold step by the council to do this but once we did the deal with HSBC it unlocked it, and the council's committed to doing future phases." "You've got engaging ground floor uses, and then offices or residential upstairs. Getting that mix is important. Offices have people during the day, but you still need people at night and the weekend. That constant presence creates active, lively cities." He adds: "Retail is changing, and the way we live is changing. Development is more about place, and place-making, and you can't do that with one use on its own." From the highest floor of the neighbouring car park, a green, turf-covered roof can be glimpsed on a smaller unit that complements Grosvenor House and will contain two restaurants. This eco-friendly approach was followed in the main premises. "The building's very high on sustainability," says Mark. "It's the top office in Sheffield in terms of its technical specification." The offices will be ready early in January and marketing is about to be ramped up, Tim confirms. "Fingers crossed we can land one of the people we're speaking to." The council, he states, 'would never have considered a building of this scale speculatively'. "I'm not sure any developer would," Mark says.